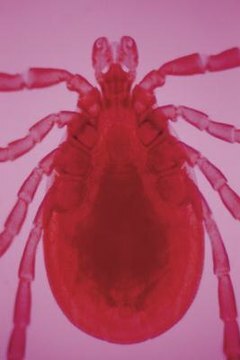 Reports of tick-borne illnesses continue to rise in the United States. Of particular concern is Lyme disease, one of the most common ailments in the northeast and along the Atlantic seaboard states, which is spread mainly by deer ticks. If you live in an area where these ticks are plentiful, it's a good idea to learn the differences between male deer ticks (which don't transmit diseases) and female deer ticks (which sometimes do). Ticks come in two types: soft and hard. Deer ticks (Ixodes scapularis) are hard ticks, meaning they have a scutum—Latin for shield—on their dorsal (top) side. In most hard ticks, this shield has indentations called festoons on the lower edge. However, deer ticks have no festoons. The hypotome, the harpoon-like structure that anchors the tick to its prey, is visible at the head on a hard tick. Deer ticks use three hosts, one for each phase of life: larva, nymph and adult. Only adult deer ticks can be visually sexed. Both males and females have eight black legs. The female tick is the larger of the two. She has a dark brown head and a dark brown upper body. Bright red or orange forms a horseshoe shape below her scutum. The smaller male is completely dark in color.